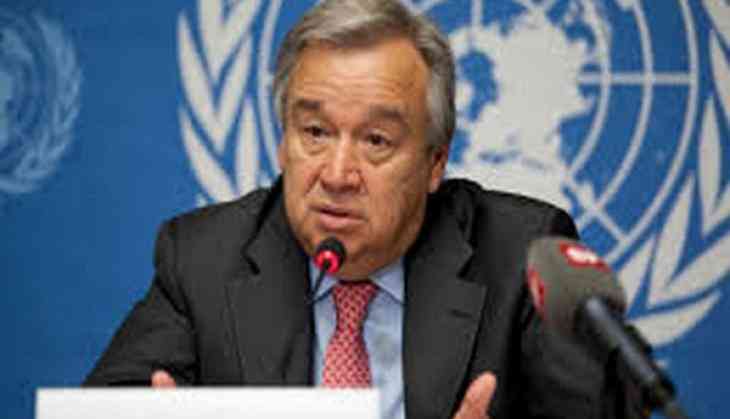 United Nations Secretary-General Antonio Guterres condemned the loss of lives in the recent Israel- Palestine clashes in Gaza. As reported by the Anadolu Agency on Thursday, Guterres deplored the loss of lives and expressed his condolences to the Palestine people. "My first words are to deplore the tragic loss of lives and suffering in Gaza and to express my deep sadness and condolences to the Palestinian people," Guterres said in a statement. He further called for restraint on the use of force particularly live fire. He also called on Hamas and its leaders to take responsibility for the demonstrations. On Monday, 62 Palestine demonstrators were killed and thousands were injured by Israeli forces along the Gaza border, as per Palestine Health ministry. "It is imperative that everyone show the utmost restraint to avoid further loss of life, including all civilians and particularly children are not in harm's way. The cycle of violence in Gaza must end, it serves no one," Palestine Health ministry noted. Though, Pentagon on Thursday justified Israeli violence against Palestinians. Thousands of Palestinians had gathered on the Gaza Strip's eastern border to take part in protests marking the 70th anniversary of the founding of Israel which Palestinians refer to as the Nakba, Arabic for "Catastrophe" and protest the relocation of the U.S. Embassy from Tel Aviv to Jerusalem.